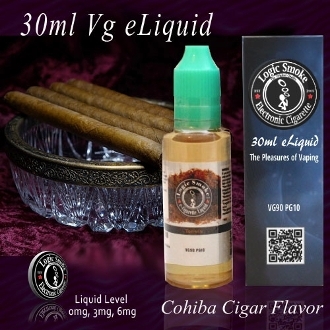 Our Logic Smoke Cohiba cigar favored electronic cigarette Pg Vg Vape Juice presents a flavor that is unsurpassed! With a rich toasted tobacco flavor, a variety of other different flavor undertones can be recognized in this complex e-liquid. Everyone has a different palate and opinion on this particular e-liquid. Hints a creamy cocoa. Some get faint aromas of coffee, while others experience a more spicy/cedar flavor. Fill your favorite MOD unit with Logic Smoke Cohiba flavored e-liquid and try it today! Which taste experience will you have?